Our very Full House: Hail to the Chief! 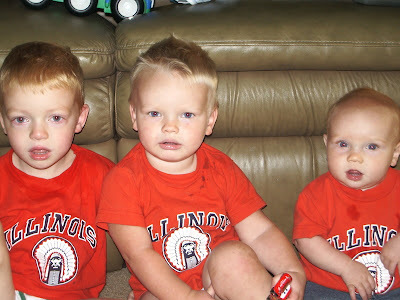 The tradition of Chief Illiniwek is, sadly, now officially gone....but for the Merritt household, it will continue! 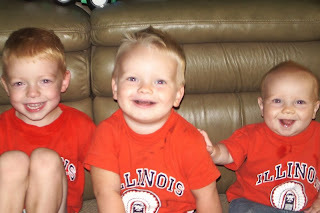 Maybe not forever.....but at least for as long as these shirts continue to fit the boys! Now, lest you think that I ran out and bought them each new shirts, I must tell you--these shirts have all been Colin's at one time. 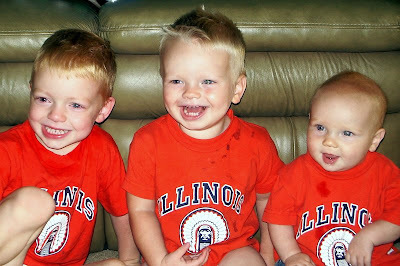 We LOVE the Fighting Illini, and I have bought Colin a Chief shirt in almost every size. Ethan is wearing a 12 month; Cameron a 2T, and Colin a 4T. There are also 6 month, 18 month, and 3T sizes in the house--in rubbermaid tubs, packed away until they are needed (which, will be soon for Cameron--he is starting to have to be packed into the 2T.) I am debating going on a search for a few of these same shirts in bigger sizes, so they can all three have them for a little bit longer! The shirts are becoming harder to find, now that the Chief has been retired....so it may be quite the quest to locate a few more. I am weighing whether or not it is worth it. Most of me says it is. First shot--not too much into the picture taking idea yet. Second shot--tons better than the first, but not looking at the camera! They were looking at Shane, who was next to me trying to get them to laugh! Third shot: Cameron goofing around and doing something that the other two apparently found hilarious! Fourth shot: I must say thank you to Shane, for REALLY making them laugh and look at the camera at the same time--and giving me a great new picture! ok these pictures just aren't enough for me anymore! I have got to see these boys soon!!!! Oh my goodness, I found Devin "Eller"! (I found you through Jill's blog) I had to scroll and scroll and STARE at these pictures because I can't believe how you've "grown up"! I really didn't think it was you until I saw your mom, then I knew it had to be you! The last time I saw you you were wearing that beautiful red dress to the Spring Formal at Harrison Park, and now you have 3 adorable boys! Wow, much to catch up on. I don't personally blog, (Paul does), but I'm trying to use facebook :) Congratulations on your beautiful family! 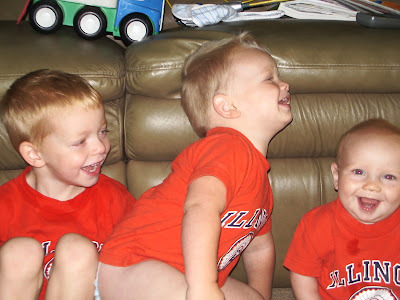 Just another look at your blog to see the fabulous brothers three!! I can't get enough of them:) and it's so cool to be able to see them on here. Thanks for doing such a great job Dev with your Merritt Blog. I love it! hey dev. did you get those pics ok??? Rog sent them yesterday I think. let me know. So cute! Dev, did you get the pic's ok, I sent them all yesterday? Let me know. Also, did you get my message about October, and Luke's b-day? Got the pics! Thank you both so much, they are great. They are going to work perfectly for what I need them for...and don't even ask what that is, cause I ain't telling (yet!). Love you both! Kar, are you coming or what?! I am trying to figure out if I can spend the money right now, because I can't stay a whole week away from work, it's a little more expensive coming from a Thurs-Tues, so hopefully we'll be able to do it. It would be the 11-16. I'm glad you got the pic's.